Items on the agenda included the construction of the first stage of the SITRAMSS metropolitan transit system, the inauguration of the new “Women’s City” service center in the department of Morazán and the signing of the second Millennium Challenge Corporation compact with the US government. Those present from the Funes cabinet included Secretary of Strategic Affairs and Minister of Education ad honorem Franzi Hato Hasbún, Chief of Staff Alexander Segovia, Treasury Minister Carlos Cáceres, and Ministers of Security and Defense, Ricardo Perdomo and General David Munguía Payés, respectively. Representing Cerén’s Transition Commission were Vice President-elect Oscar Ortiz, legislators Lorena Peña and Norma Guevara, Legislative Assembly President Sigfrido Reyes, FMLN Secretary General Medardo González and Central American Parliament (PARLACEN) representatives José Luis Merino and Manuel Melgar. Following the transition meeting, legislator Lorena Peña announced the planned creation of a Ministry of Culture and a Ministry of Women, as detailed in the FMLN’s 2014 platform, along with a Ministry of Sports. The Ministry of Culture will be born out of the existing Cultural Secretariat of the Presidency, while the Women’s Ministry will combine the Salvadoran Institute for Women’s Development (ISDEMU), the Social Inclusion Secretariat and the “Women’s City” service centers. The National Sports Institute of El Salvador (INDES), meanwhile, will be transformed into the new Ministry of Sports. 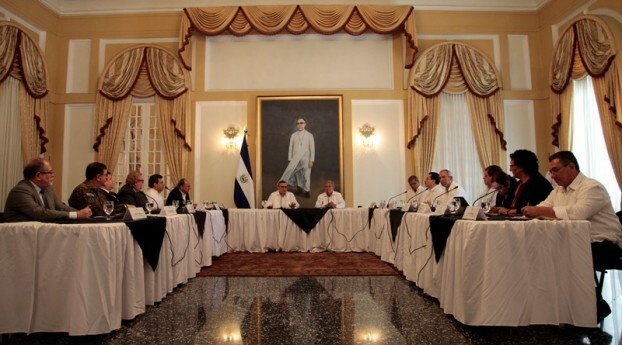 The new government will also create a Secretariat of Public Investment to attract investment in the country, along with a Ministry of Cities that will channel the work of public institutions like the Social Investment Fund for Local Development (FISDL), the Salvadoran Municipal Development Institute (ISDEM) and the Vice-Ministry of Housing and Urban Development (VMVU). This entry was posted in News and tagged Ciudad Mujer, FMLN, free and fair elections, Salvador Sánchez Cerén, transition. Bookmark the permalink.